An eagle-eyed bobby has been credited with smashing a suspected resort drugs ring. Detectives discovered a £200,000 haul of cash and drugs after officers pulled over a car in Blackpool town centre. A ‘quantity’ of suspected cocaine and cannabis was found in the Peugeot 3008, which was stopped in Cookson Street after a patrolling officer reported seeing suspicious activity. Drugs raids later carried out at two homes in Thornton and central Blackpool turned up £100,000 at each, police said. A 73-year-old man, his 38-year-old son, and a 25-year-old man were arrested on drugs and money laundering offences and spent yesterday being questioned. Sgt Adam Leigh from Blackpool CID said: “It was excellent proactive police work by an on-duty officer. The bust was not as the result of ongoing surveillance or intelligence, Sgt Leigh said, but because the officer reported what he saw – although detectives remained tight-lipped on what aroused suspicions. The Peugeot – which was being driven by the 38-year-old – was pulled over at around 6pm on Wednesday, a ‘short time’ after first being spotted. Both the driver and his 25-year-old passenger were arrested at the scene on suspicion of possessing cannabis, supplying cocaine, and money laundering. 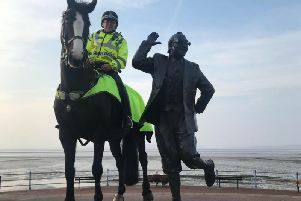 The 73-year-old was later arrested on suspicion of supplying cocaine and money laundering when officers executed a drugs warrant at the address in central Blackpool. Searches were carried out onTuesday and Wednesday, it is understood. Police would not say where exactly they were conducted. A police spokesman added: “It’s fair to say we were following enquiries as a result of a spontaneous incident earlier that day. It was not as a result of a pre-planned operation.